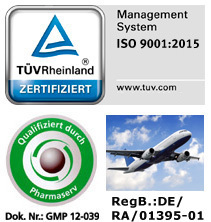 The transport of medicines is clearly associated with the control and quality. Therefore require a number of existing laws, a maximum control in the distribution of pharmaceutical products. Both the European Union and the Spanish government regulate the sector with different laws. There is a large number of these products, which require temperature controlled storage and transport within the range of 2°C to 8 ºC, of leaving the production place up to the delivery. The most critical point in the cooling chain is transport. It must be remembered that only a short time outside the recommended temperatures for certain products, which can seriously affect. The World Health Organization (WHO) estimates the fact that 25% of the medicaments those arrive at their place of destination in an unsatisfactory or even ineffective condition is.